Customers can add ChatterPals to ANY website (even ones they don’t own) to instantly boost sales, conversions and leads on blogs, ecommerce sites, bonus pages, and landing pages. The best part? With ChatterPal customers can create SMART chat automation in ANY language with in-built translation and ready made chat templates! 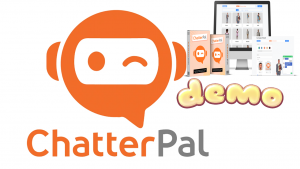 Unlike other apps, customer can create UNLIMITED ChatterPals for a low ONE-TIME cost for themselves and their clients! Commercial license is included!